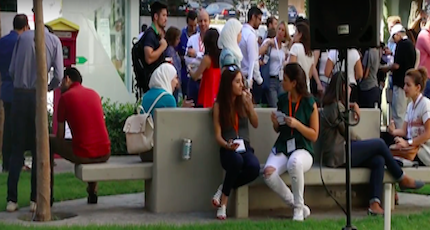 Meet some of the winners of Startup Weekend Beirut below. The winners of the competition pitched a mobile application for the deaf named AID. Here Osama Brosh and Omar Turk, both high school students, explain how the app notifies the user via vibration and light when a louder-than-usual sound was occurring, how it notifies the user about typical everyday sounds, and how it offers speech-to-text functionalities. Other team members include developer Dani Arnaout and designer Natalie Ghossein. Here the development team from digital music distribution platform Anghami demonstrates LivingBand, an app that allows friends to gather and play a song together, each "playing" a different instrument by shaking their iPhone in sync with the others (here they're playing "Knocking on Heaven's Door", we believe; apologies for the low volume). The third tied for third place. In third place, tied with LivingBand, was LingVee, a mobile application designed to teach people how to write in Arabic, by having users trace the outline of words. Here Ata Alqadi of Startup Weekend Amman and Keith Armstrong, the Regional Operations Manager for Startup Weekend, demonstrate how the that teaches people how to write in Arabic.